NS10M There were two versions of the NS10; The NS10M was originally a domestic hi-fi speaker, with vertical livery. They became very popular as a near field studio monitor speaker, not because they sounded great, but because they had a basic sound with slightly harsh high mid tones. Studios often taped toilet paper over the tweeters to try to calm the top end response. If you could get a mix to sound good and clean on NS10s it would sound really sweet on decent hi-fi speakers. As well as sounding harsh, the original tweeters were prone to blowing because they were just not robust enough to deal with uncompressed studio signals. 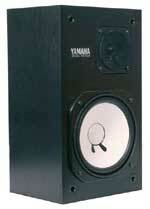 Yamaha then addressed these issues and introduced the NS10M STUDIO version, with horizontal livery for mixing desk mounting and a smoother sounding and higher rated HF tweeter. This became THE industry standard near field studio monitor. Even after they became obsolete, they remained in service in studios around the world and GB Audio continued to supply genuine replacement parts until 2016 when our source of parts finally ran out. Support: All these parts are now completely sold out.